The Knocks have been in a collaborative mood of late, releasing songs with Cam'ron and Matthew Koma. Their latest effort involves Wyclef Jean, who raps quickly and efficiently over a crisp, thudding beat. On the hook, Wyclef unleashes a scream: She's so fly/ Excuse her while she kiss the sky. 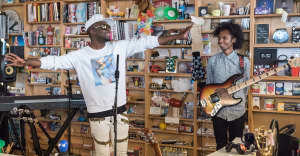 "So much dance/pop music is so SERIOUS right now," the Knocks wrote on Twitter. "Which is great… But we're here to bring the fun(k) back." Listen below, and look for the group's album, 55, on March 4.